About 1 in 200 houses are struck by lightning every year. Various factors can affect your level of risk, including whether there are higher structures nearby (metal light poles can have a protective effect), the local climate, etc. In areas such as Las Vegas where afternoon thunderstorms are common, the risk is obviously a little higher than in calmer skies. What Might Happen if Your House is Struck by Lightning? It may start a fire. In some cases, the fire may start in areas that aren’t immediately obvious, such as in your attic insulation. Yes, it is possible to be electrocuted if you are using a landline phone – but only if you have a corded handset, and even then it is extraordinarily rare. Most people these days either don’t have landlines at all, or use a cordless handset. Phone lines are also protected from surges. Fiber optic lines often have metal elements, so are just as likely to conduct lightning as old style copper. Desktop computers are also a risk. Don’t sit too close to the TV during a storm, use a laptop or a tablet instead of a desktop, and don’t take a bath or a shower (metal plumbing filled with water is a great route for lightning). If you have metal windows, don’t touch them during the storm. Lightning often strikes the same place multiple times. If your house is hit once it is likely to be hit again. However, you should not leave the building unless you are in imminent danger. You are safer in your house in the center of a room than outdoors. The power surge may damage appliances. Surge protectors help, but they won’t protect from a direct strike. Lightning can cause a shock wave, which can blow out windows, damage brick and stone chimneys, and even crack your foundation. What Should You do if Your House is Struck? Call the fire department immediately. As mentioned, fires started by lightning are not always immediately obvious. Attic insulation or inside the walls are common locations. If you smell smoke or see fire, evacuate. If you have a metal sided (not fiberglass shell) car, that’s a very safe place to be for the rest of the storm. Otherwise, it may be safer to stay put. Call your insurance company and tell them the building was hit. What Should You do Afterwards? Call a trusted electrician and have them inspect your wiring system. Even if you think there’s no damage, avoid putting a lot of strain on the electrical system until it has been checked, as that might start a fire. Most electricians will treat this as an emergency situation. Have your foundation, roof, and any chimneys inspected for damage. Sometimes damage may be immediately visible. Chimneys are in particular risk. Keep sensitive electronics on a Uninterruptible Power Supply (UPS) or surge protector, but bear in mind it won’t provide full protection. If possible, unplug as much as possible during the storm. However, depending on your risk that might be too much hassle, or you might be away from home when the storm hits. Back up your data to the cloud or offsite. Your computer can be replaced. Your family photos from that reunion three years ago are a little harder. 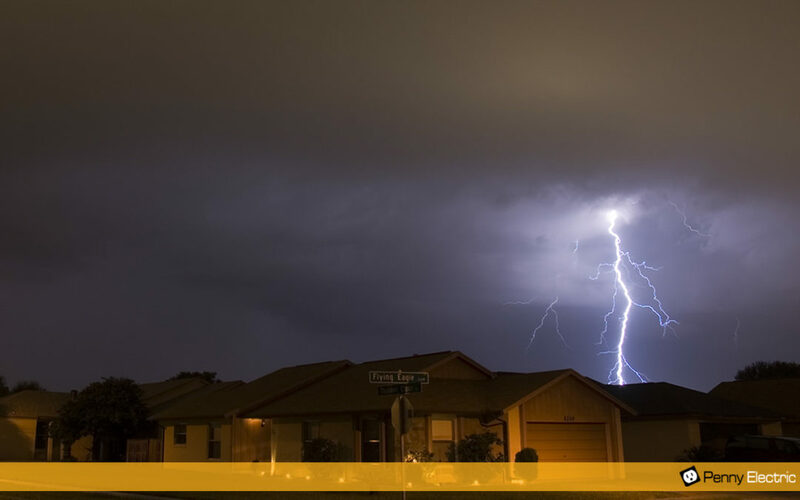 If you are in an area where lightning strikes are frequent, consider purchasing a home lightning protection system. These systems are expensive, but can reduce the chance of damage from lightning to a fraction of what it would be without the system. If you need advice on protecting your electrical system from those afternoon storms, or if you have damage and need your house inspected, contact Penny Electric. We provide emergency services 24/7.